I had to work Thanksgiving day. Don’t feel sorry for me! It was only four hours and it meant I was off on Black Friday – I was fine with it. My folks showed up at the Wal-Mart Thursday morning. They had mentioned they might stop by. How did I know they were there? The flash went off!!! That’s right folks, it was like high school all over again: the proud mom snapping photos while you wish she would stop or you would melt away. Me: Yep, those are my parents. 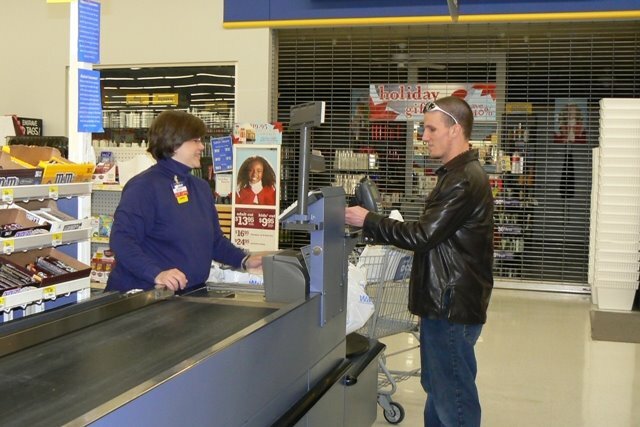 Surprised me for the holiday and are now taking photos of me working at Wal-mart. Him: You gonna run put those on your My Space page? 2. That guy figured I was young enough to have a My Space page. This reminds me of when I was in PCB for Project and my parents came to visit. They took pictures of me in uniform working at McDonalds. Fun times! So funny. And I bet you are going to do exactly the same one day to your kids when you are hoary-haired. And you will STILL have a My Space page. I am cracking up! I can totally picture your parents in action :). They are great!